Although given birth in Manhattan in the year 1941, it wasn’t until the vodka craze of the 1950’s that the Moscow Mule became one of the most popular mixed drinks across the country. This was most evident in Los Angeles, where Hollywood’s hottest stars and bigwig producers made a habit of ordering this simple combination of vodka, fresh squeezed lime juice and ginger beer. Originally made with lemons instead of the limes, the Moscow Mule gets its unique flavor from ginger beer—a carbonated soft drink flavored with ginger and sweetened with sugar. 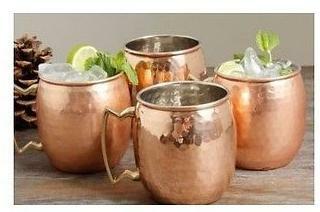 The other distinctive characteristic of the Moscow Mule is the iconic copper mug it is typically served in. This tradition was started by the drink’s inventor, John G. Martin, who traveled around the country to sell Smirnoff vodka and popularize the Moscow Mule. He would go from bar to bar asking bartenders to pose with a bottle of Smirnoff vodka and the specialty copper mug as he snapped two pictures with his Polaroid camera. The first was left at the bar for display and the second was added to his collection to be shown to forthcoming bartenders. With only three simple ingredients, you can make a delicious Moscow Mule at home anytime you want. First, combine the vodka and ginger beer in a specialty copper mug filled with ice (a highball glass is recommended if you do not have one). Next, add freshly squeezed lime juice and stir. Finally, garnish with a slice of lime and enjoy. FREE SHIPPING through December 31, 2015!